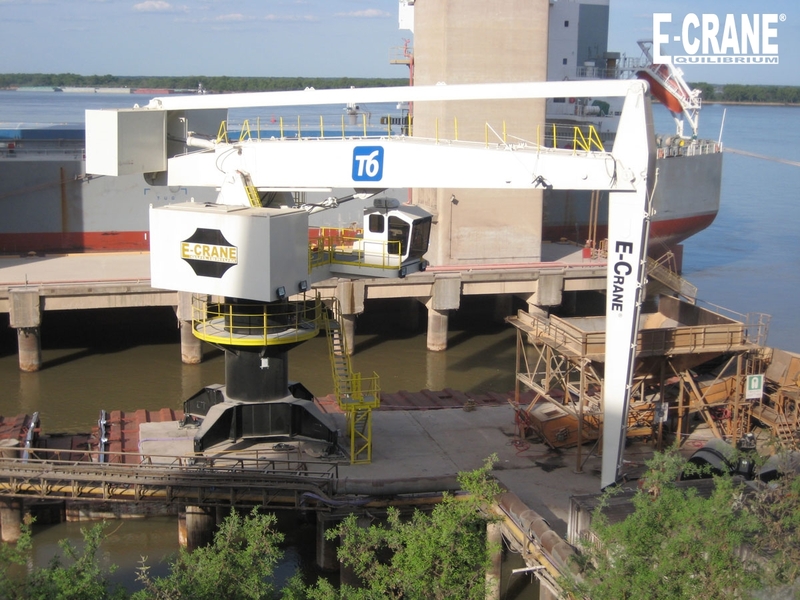 New E-Crane at Terminal 6 S.A.
You are here: Home › News › New E-Crane at Terminal 6 S.A.
Last week, a brand new 1500 Series / Model 11264 pedestal mounted E-Crane was installed at Terminal 6 S.A. in Argentina on the Paraná River near Rosario. The new E-Crane has an outreach of 26,4 m (86.5 ft) and a lift capacity of 19 Mtons (20.9 UStons). 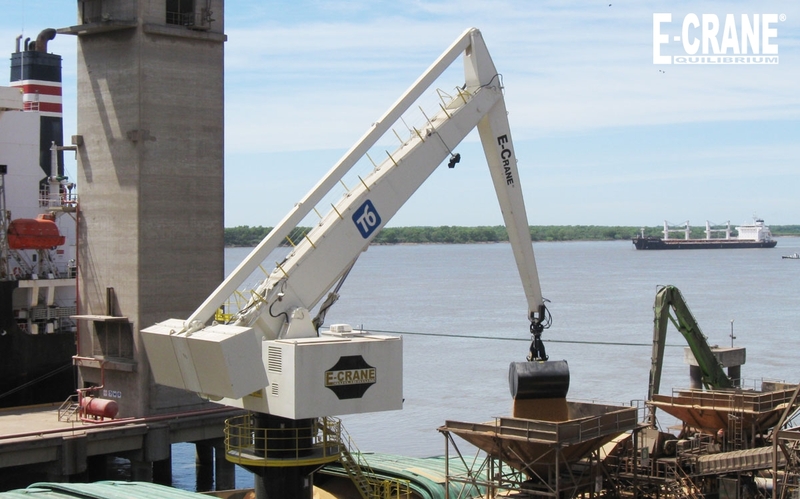 The crane is being used to unload soy beans as well as various other grains from Mississippi and Paraná sized barges into a hopper/conveyor system. 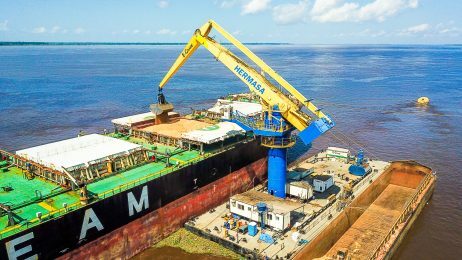 Terminal 6 S.A. began talks with E-Crane about a potential project on the Paraná river back in 2007 with the goal of increasing the productivity and capacity of their port. 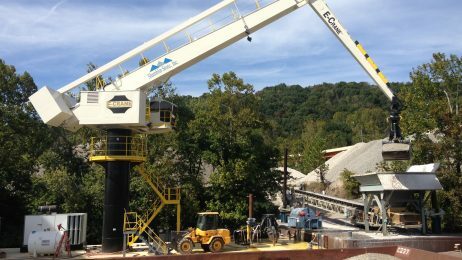 Soy beans were originally unloaded at the facility using a diesel driven cable crane along with a small material handler. Each machine was achieving a production rate of about 400 tph. Terminal 6 S.A. considered many different material handling options, but ultimately chose the E-Crane to maximize their operation. 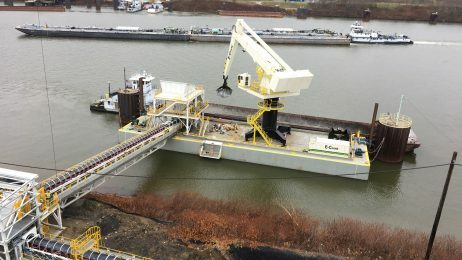 The cable crane was removed from the site and the new E-Crane was installed in its place. 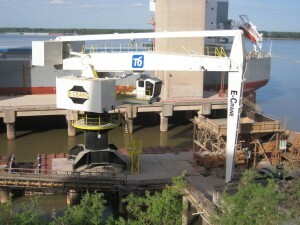 The E-Crane is mounted directly onto a new addition to the existing dock. Terminal 6 S.A. is a joint venture between Bunge, and Aceitera General Deheza. It was founded in 1985 and has grown to become the largest soya meal exporting terminal in Argentina. 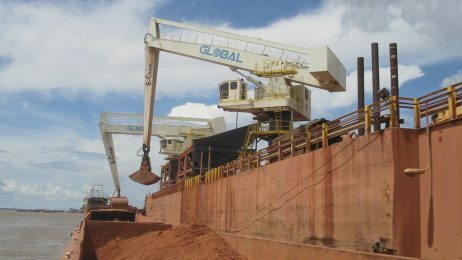 The terminal also ships and handles grains and vegetable oils, along with other dry agribulk. 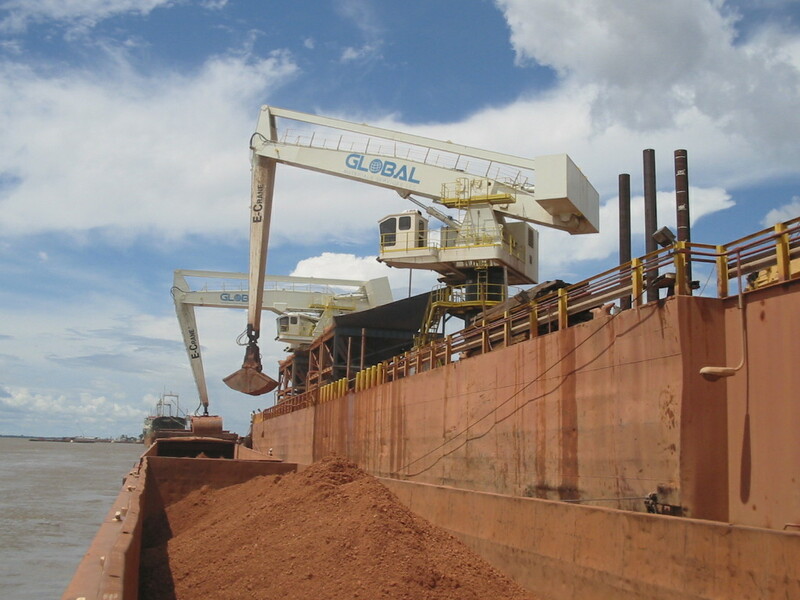 Terminal 6 S.A. is Argentina’s first private port, and has the facilities to store up to 950 thousand tons of dry bulk materials as well as 110 thousand tons of liquid materials.